Orange juice is defined in the United States Code of Federal Regulations as the "unfermented juice obtained from mature oranges of the species Citrus sinensis or of the citrus hybrid commonly called Ambersweet." True fresh squeezed juice is difficult to market commercially because it requires special processing to preserve it. Orange juice is commonly marketed in three forms: as a frozen concentrate, which is diluted with water after purchase; as a reconstituted liquid, which has been concentrated and then diluted prior to sale; or as a single strength, unconcentrated beverage called NFC or Not From Concentrate. The latter two types are also known as Ready To Drink (RTD) juices. 1 Oranges are harvested from large groves. Some citrus growers are members of cooperative packing and marketing associations, while others are independent growers. When the mature fruit is ready to pick, a crew of pickers is sent in to pull the fruit off the trees. The collected fruit is sent to packing centers where it is boxed for sale as whole fruit, or sent to plants for juice processing. The oranges are generally shipped via truck to juice extraction facilities, where they are unloaded by a gravity feed onto a conveyor belt that transports the fruit to a storage bin. 2 The fruit must be inspected and graded before it can be used. An inspector takes a 39.7 lb (18 kg) sample to analyze in order to make sure the fruit meets maturity requirements for processing. The certified fruit is then transported along a conveyor belt where it is washed with a detergent as it passes over roller brushes. This process removes debris and dirt and reduces the number of microbes. The fruit is rinsed and dried. Graders remove bad fruit as it passes over the rollers and the remaining quality pieces are automatically segregated by size prior to extraction. Proper size is critical for the extraction process. 3 Proper juice extraction is important to optimize the efficiency of the juice production process as well as the quality of the finished drink. The latter is true because oranges have thick peels, which contain bitter resins that must be carefully separated to avoid tainting the sweeter juice. There are two automated extraction methods commonly used by the industry. The first places the fruit between two metal cups with sharpened metal tubes at their base. The upper cup descends and the fingers on each cup mesh to express the juice as the tubes cut holes in the top and bottom of the fruit. The fruit solids are compressed into the bottom tube between the two plugs of peel while the juice is forced out through perforations in the tube wall. At the same time, a water spray washes away the oil from the peel. This oil is reclaimed for later use. 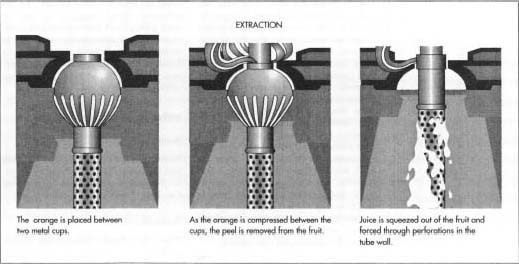 The second type of extraction has the oranges cut in half before the juice is removed. The fruits are sliced as they pass by a stationary knife and the halves are then picked up by rubber suction cups and moved against plastic serrated reamers. The rotating reamers express the juice as the orange halves travel around the conveyor line. When the mature fruit is ready to pick, a crew of pickers pull the fruit off the trees. Once collected, the fruit is sent to plants for juice processing. Before extraction, the fruit is cleaned and graded. Some of the peel oil may be removed prior to extraction by needles which prick the skin, thereby releasing the oil which is washed away. Modern extraction equipment of this type can slice, ream, and eject a peel in about 3 seconds. 4 The extracted juice is filtered through a stainless steel screen before it is ready for the next stage. At this point, the juice can be chilled or concentrated if it is intended for a reconstituted beverage. If a NFC type, it may be pasteurized. 5 Concentrated juice extract is approximately five times more concentrated than squeezed juice. Diluted with water, it is used to make frozen juice and many RTD beverages. Concentration is useful because it extends the shelf life of the juice and makes storage and shipping more economical. Juice is commonly concentrated with a piece of equipment known as a Thermally Accelerated Short-Time Evaporator, or TASTE for short. TASTE uses steam to heat the juice under vacuum and force water to be evaporated. Concentrated juice is discharged to a vacuum flash cooler, which reduces the product temperature to about 55.4° F (13° C). A newer concentration process requires minimal heat treatment and is used commercially in Japan. The pulp is separated from the juice by ultra-filtration and pasteurized. The clarified juice containing the volatile flavorings is concentrated at 50° F (10° C) by reverse osmosis and the concentrate and the pulp are recombined to produce the appropriate juice concentration. The flavor of this concentrate has been judged to be superior to what is commercially available in the United States and is close to fresh juice. Juice concentrate is then stored in refrigerated stainless steel bulk tanks until is ready to be packaged or reconstituted. 6 When the juice processor is ready to prepare a commercial package for retail sale, concentrate is pulled from several storage batches and blended with water to achieve the desired sugar to acid ratio, color, and flavor. This step must be carefully controlled because during the concentration process much of the juice's flavor may be lost. Proper blending of juice concentrate and other flavor fractions is necessary to ensure the final juice product achieves a high quality flavor. In an automated process, the juice is extracted from the orange while the peel is removed in one step. bacteria, yeast, and mold growth. However, pasteurization is still required to further retard spoilage. Pasteurization also inactivates certain enzymes which cause the pulp to separate from the juice, resulting in an aesthetically undesirably beverage. This enzyme related clarification is one of the reasons why fresh squeezed juice has a shelf life of only a few hours. Flash pasteurization minimizes flavor changes from heat treatment and is recommended for premium quality products. Several pasteurization methods are commercially used. One common method passes juice through a tube next to a plate heat exchanger, so the juice is heated without direct contact with the heating surface. Another method uses hot, pasteurized juice to preheat incoming unpasteurized juice. The preheated juice is further heated with steam or hot water to the pasteurization temperature. Typically, reaching a temperature of 185-201.2° F (85-94° C) for about 30 seconds is adequate to reduce the microbe count and prepare the juice for filling. 8 To ensure sterility, the pasteurized juice should be filled while still hot. Where possible, metal or glass bottles and cans can be preheated. Packaging which can not withstand high temperatures (e.g., aseptic, multilayer plastic juice boxes which don't require refrigeration) must be filled in a sterile environment. Instead of heat, hydrogen peroxide or another approved sterilizing agent may be used prior to filling. In any case, the empty packages are fed down a conveyor belt to liquid filling machinery, which is fed juice from bulk storage tanks. The filling head meters the precise amount of product into the container, and depending on the design of the package, it may immediately invert to sterilize the lid. After filling, the containers are cooled as fast as possible. Orange juice packaged in this manner has a shelf life of 6-8 months at room temperature. Byproducts from orange juice production come from the rind and pulp that is created as waste. Products made with these materials include dehydrated feed for livestock, pectin for use in making jellies, citric acid, essential oils, molasses, and candied peel. Certain fractions of orange oil (known as d-limonene), have excellent solvent properties and are sold for use in industrial cleaners. Quality is checked throughout the production process. Inspectors grade the fruit before the juice is extracted. After extraction and concentration, the product is checked to ensure it meets a number of USDA quality control standards. The most important measurement in orange juice production is the sugar level, which is measured in degrees Brix (percentages by weight of sugar in a solution). The types of oranges used and the climate in which they were grown effect the sugar level. Manufacturers blend juices with different sugar levels together to achieve a desired sugar balance. The final juice product is evaluated for a number of key parameters include acidity, citrus oil level, pulp level, pulp cell integrity, color, viscosity, microbiological contamination, mouth feel, and taste. A sensory panel is used to evaluate subjective qualities like flavor and texture. Lastly during the filling process, units are inspected to make sure they are filled and sealed appropriately. Future processing improvements are likely to come from the use of computer controlled sizing and grading of fruit. Orange juice formulations will see changes as the trend toward adding more nutrition-oriented ingredients, such as antioxidants, continues. In addition, future formulas are likely to be blends of orange juice with other, more exotic, fruit flavors, like kiwi, or even vegetable juices, like carrot. Nelson, P.E. and D.K. Tressler, ed. Fruit and Vegetable Juice Processing Technology. Westport, Connecticut: AVI Publishing Co., 1980. "Juice Up." Food Product Design (July 1997). "Unconcentrated Effort." Food Processing (November 1996). Is process of manufacturing orange pulp is different from orange juice? or the pulp recovered from juice production process is taken as final pulp? If we want to filled the orange juice by hot fill method at 90C. Beside vitamin, what else were lost/damage by the heat treatment? Thanks for posting this article! It's extremely helpful. I needed to research on how products were made, and what machines and people were involved. Thank you! More power! Please i wanna know more about it i mean what are the ingredents in orange juice how it will prepared because i'm gonna go to make presentation about it. Could you please give me more about it. Seriously I love this article.it will go a long way to help me get something doing.pls can u recommend more books on this topic.thanks a bunch. I am interesting to begin this business in Africa to be specific Ghana. But my problem is how to get the additives and perservatives. In addition the box for the package. thank you.